In 2018, SEGD broke our previous records for revenue, membership and demographics, event attendance, website traffic, content and education resources—again. It was a strong year financially with our best ever annual income and the highest reserves. Costs and overhead were well managed, which means we will add a sizable amount to our reserves again this year. SEGD has three sources of income which contribute roughly one third each to our results: membership, event registration and sponsorship & advertising revenue. The organization did well and showed growth in all three areas this past year. Five years ago, as part of the Strategic Plan, we set a target of saving six months' worth of revenue (considered a best practice for a well-run association). We should complete that goal by the end of 2019, ensuring the long-term viability of SEGD by putting us in a favorable position in the case of economic volatility. In contrast to the historical pattern of saving and then draining reserves with economic upturns and downturns, we are attempting to use increasing revenues in the next up cycle to invest in benefit improvements. To be clear, it has never been about money but without doing well financially, we do not have the means to create better benefits for you—and increasing value for our members is what gets us up in the morning. Apparently, it is also what drives you to become a member! You set a new record for the fourth year in a row in 2018, finishing the year with 2,307 members (up from a record 2,139 in 2017). It is hard to imagine that at the end of 2012, we were only at 1,221 members. SEGD's membership has almost doubled. We have almost 500 students, nearly double the number in 2017. Perhaps even more impressive is the fact that most associations are struggling to attract Millennials. SEGD, on the other hand, has flipped from about 65 percent Baby Boomers and an aging membership in 2012 to 19 percent Baby Boomers, 34 percent Gen X (who now constitute SEGD's leadership) and 47 percent Millennials today—and that demographic is holding steady. Now more than half our members are under 40. By the way, we did not lose the Baby Boomers! It's just that all the new members are from the next generations. Our membership also identifies as 47 percent female and 53 percent male, roughly in line with the composition of the US workforce. Why Are We Attracting Millennials? We're succeeding with Millennials because, five years ago, the SEGD Board voted to focus strategically on delivering 50 percent of our benefits physically and 50 percent digitally. They embraced the shift of our community from strict signage to a more experience-based practice as that trend began to play out in the U.S. economy. Millennials experience the world digitally first, and SEGD is leaps and bounds ahead of the other design organizations when it comes to the development of our digital platform, from a digital association brochure and then the SEGD content portal and then a knowledge base for the profession and then a set of apps to help you develop your career and business. This is not to say we feel we are "there" yet. We know there is still a lot of work ahead, but the staged development of our digital presence is resonating well with the younger generations. Over the past five years, SEGD has developed over 7,500 new articles for the website. They are all search optimized and have been tagged and organized into a knowledge database as well as used in our Member Toolbox apps. 83 percent of SEGD's content is about YOU—the member, your firm and your amazing work. Google searches account for 433,000 (72 percent) of our annual 550,000+ visits to the website because visitors find content about you and your projects that way. SEGD.org is like a massive digital megaphone for members and their firm. The more you post on SEGD.org, the more people come to look at you! Even more impressive is how our digital strategy and search optimization is feeding the SEGD.org traffic back to your websites. Over 140,000 SEGD.org's visitors clicked on a link to members' sites last year. SEGD.org now acts like a giant amplifier projecting your content out to a much larger audience than almost any member's website and social outreach can achieve. When you join SEGD, you gain access to that megaphone to help promote your work to an audience interested in what you can do for them! We have surpassed our strategic goal of providing half of our membership value digitally. In fact, we are providing closer to 10 times the cost of membership in digital benefits and value. 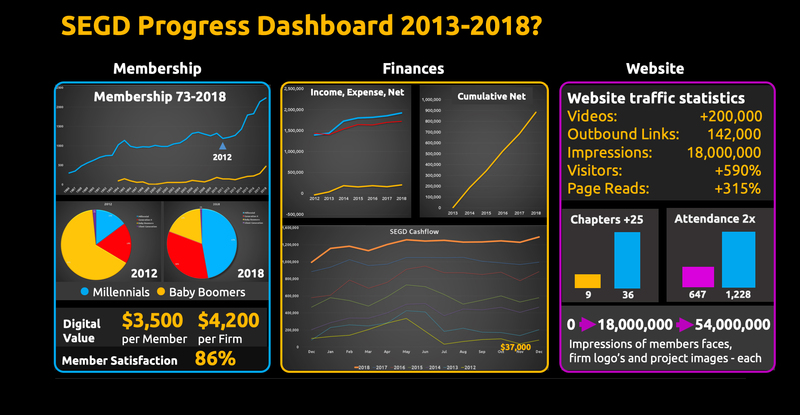 That's about $3,500 per member per year and now that we are on a continuous innovation cycle with the website, we have no intention of stopping there! Creating digital value has been critical in attracting international as well as Millennial members and also in creating value for the more than 50 percent of our members who don't attend SEGD's physical events. Last year, the SEGD Board voted to maintain our present direction and extend our Strategic Plan activities for another two years. Our results strongly indicate that we are moving in the right direction when we benchmark ourselves against other design organizations. However, the work, especially in the area of education support has been far greater than we ever imagined, and we need to see it through to completion before working on the next level of development of the profession. We are becoming more useful to the members, but definitely not VITAL yet. Where is SEGD headed next? Hint: the SEGD board is already looking at possibilities to elevate the value and positioning of EGD. Similar to other design professions as the experience economy develops a full head of steam, we need to be developing design management skills (See our new professional management competencies framework.) and design leadership positions at the city and corporate level. Have you noticed that most Chief Design Officers (CDOs) and design leaders do not come from EGD backgrounds? Let's change that in the future as we move ever closer to an experience-driven economy. Already over half of Millennials say they would rather buy an experience than a product or service and that trend continues to accelerate. It's great news for the profession! SEGD has laid a solid foundation for the future and through 2019, we will continue working on education and Professional Learning support for the community. The EGD field is growing rapidly and SEGD is helping to improve resources for educators, design professionals who want to transition into EGD practice and practicing EGD professionals who would like to improve their skillset and grow in their career. Our knowledge base can be searched at present using three parameters: practice areas, industry/market verticals and geography. What we are working on now is to be able to search our content and data by Core Competence.This next step will help you find the resources you need to improve your EGD and professional management skillsets. We have been working on this phase for the past year and though some of that work is visible on the website at the moment, it will become a lot more visible as we move to the next iteration of the website later in the year. The Academic Task Force is busy producing five more workbooks to compliment the four produced in 2017 to support this phase of developing our education resources. If you have not seen the SEGD Workbooks on research,detailing and documentation,prototypingand presentation,you should definitely take a look. The workbooks pull together relevant content about these competency areas, including case studies and project examples. They represent fantastic work by the Task Force, so be sure to check them out. Every year the Academic Task Force publishes a call for papers. 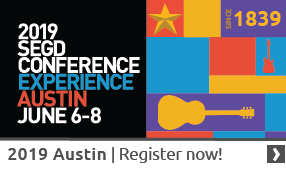 This is a peer-reviewed process and those who are selected appear in the on-line Communication + Place publication and also have the chance to present their papers at the SEGD Academic Summit, June 5 in Austin. Please encourage those with new ideas and thoughts on the profession to publish their papers. The call for papers is open until March 1. In the November 2018 Board meeting, the SEGD board voted to contribute a part of our net income every year to grow the education fund, a big step in the right direction. SEGD is making that commitment and we hope that it will encourage you as a successful designer or firm leader to think about donating to help build the fund for education. There are many ways to achieve it: by contributing an annual recurring amount, as a one-time tax-deductible gift, or as part of your will. If you have enjoyed practicing in EGD and want to provide a legacy of support for others to come into the profession in the future, please consider a contribution. You know how this works: It takes all of us to contribute what we can to build a strong future for the profession. In 2012 we had nine chapters and about 15 Chapter Chairs. Today we have 36 Chapters (26 nationally and 10 internationally) and over 80 Chapter Chairs. The strength and growth of our Chapter structure is another reason that SEGD is so strong today. The Chapters provide local support and opportunities to connect and network and learn from your peers. Some of the Chapter events are larger than national events were in 2012! Whenever you see your chapter chair, please thank them for the fantastic work they do and offer to volunteer your help. We are working at the Chapter level on connecting to the students, faculty and colleges as well. Ellen Bean Spurlock, the Chapter Education Liaison is working to help connect internship opportunities with students who are looking for them and vice versa. If you are looking for a summer intern, please let us know and we will help connect you to the students interested in an internship this summer. Building a new profession is not easy but looking back it is certainly satisfying to see that we are making solid progress in that direction. Thank you all for your fantastic support of SEGD, your professional organization, and the encouragement to continuously push for improvement. There has never been a more exciting time to be a member of SEGD. Here's to another year of growth!